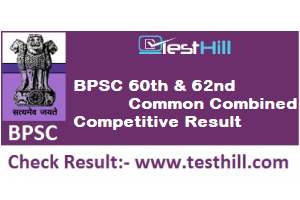 Bihar Public Service Commission has declared BPSC 60th & 62nd Pre-Common Combined Competitive Result 2017. Candidates who have appeared in the BPSC 60th & 62nd CCC Examination are able now to check their pre-examination result. The BPSC CCC examination was conducted on 12th Feb 2017. This examination was organized to fill up 642 vacant seats at 390 examination centers in 35 district headquarters of the state. In this examination, 10X the candidates are selected. A total of 1,60,086 candidates took part in this examination, out of which 8,282 candidates got success in this examination. Bihar Public Service Commission has already told the appeared candidates about their selection for further process of selection. Let me tell you that only those candidates who have qualified the BPSC Common Combined Competitive Prelim Examination 2017 will be able to join the BPSC CCC mains examination. So, this BPSC result is very important for each participant.